Boost your A/V knowledge in 5 minutes or less! These technical and business-focused quick tips are sure to be helpful with upcoming projects–also share them with customers to help promote ideas and solutions. Presented by Rob Ziv, Business Development ManagerIncrease profits by reducing installation time with HDBaseT technology. 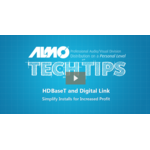 Learn about Panasonic's variant of HDBaseT, Digital Link and other products that allow you to utilize HDBaseT connectivity. 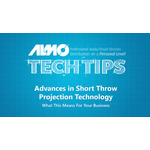 Presented by Rob Ziv, Business Development Manager, Almo ProAVThis video gives an overview of using projector stacking to reduce costs and increase system uptime in HoW applications. Presented by Rob Ziv, Business Development ManagerIn this installment we review how the American's with Disability Act Impacts most Pro AV installations and the fundamentals of assistive listening technologies to ensure compliance with the law. Presented by Rob Ziv, Business Development ManagerUnderstand and overcome the technical challenges of installing Digital Signage outdoors so you can take advantage of opportunities in this growing market segment. Presented by Rob Ziv, Business Development ManagerIn this intallment Rob Ziv takes a look at matching wireless signal distribution solutions to an application. We'll do this by comparing the feature set of various products to see how this impacts suitability. 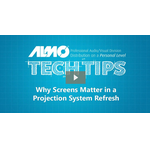 Presented by Rob Ziv, Business Development Manager, Almo ProAVWe take a look at how you aren't married to your projection screen and how replacing the projection surface will enhance a projection system refresh. Presented by Rob Ziv, Business Development ManagerThis video gives an overview of market opportunities, environmental issues and standardized rating systems for outdoor displays. Presented by Rob Ziv, Business Development ManagerShort Throw Projectors - They're Not Just for Classrooms Anymore. Find out how the latest developments in short throw technology makes these projectors more versatile than ever. Presented by Rob Ziv, Business Development ManagerThis 5 minute primer will teach you where to place wireless antennas in Pro AV systems for optimal performance. Presented by Rob Ziv, Business Development ManagerAudio intelligibility in a conference room is paramount to the success of an installed system.While starting with the right acoustics, along with speaker and mic placement is essential, sometimes you need to rely on digital signal processing to clean up your audio. We take a look at enhancing or reducing some key frequency ranges via audio filters to achieve greater intelligibility.